So you've received a Parking Charge Notice (PCN)? What do you do now? If you have any questions or believe that you have grounds for an appeal then please read through the following FAQs. You might find the answers to your questions quickly here. The quickest and most convenient way to pay your PCN is online using your debit or credit card. If you feel a PCN has been issued incorrectly, you can appeal online by selecting the Appeal a PCN button at the bottom of this page. Why is car park management required? Smart Parking manages car parks for landholders to ensure that motorists are paying for their use of parking spaces, as renting parking spaces is a business like any other, or that free time limits are being adhered to, which are commonly used by retailers to ensure that there is a regular turnover and availability of parking spaces for their genuine customers. Smart Parking ensures that the car park terms and conditions are adhered to and that the parking spaces are used correctly. Car park abuse is detrimental to landholders, and Smart Parking provides a service that ensures the efficient and regulated use of car parks. The car parks under management of Smart Parking have clear terms and conditions for parking, as detailed on the signage within the car park. If the terms and conditions for parking are breached, i.e. overstaying a free period, not paying for your parking etc., a PCN will be issued. If you feel the PCN has been incorrectly issued, we will gladly consider any appeal. To appeal against a PCN, either complete the on-line appeals form by clicking here or write to Smart Parking Ltd, Unit 43, Elmdon Trading Estate, Bickenhill Lane, Marston Green, Birmingham, B37 7HE giving the reasons for the appeal and enclosing any supporting information, i.e. a receipt to prove expenditure. Does Smart Parking have a fair appeals process? Smart Parking has gained a vast amount of experience over many years of handling parking related appeals. It goes without saying that each appeal is individually assessed by a trained appeals assessor, who will review not only the site rules, but will apply a common sense approach. If I am a blue badge holder, is my vehicle exempt from private parking rules? The Department for Transport's Blue Badge scheme for the disabled driver allows for holders of the permit to park in certain restricted areas for up to three hours (areas and times may vary, dependent upon the local authority). This concession applies to the public highway only, and is not relevant on private land. Whilst some landlords do provide preferential parking for blue badge holders, this parking is generally subject to the same terms and conditions as found elsewhere on the car park, and is sometimes charged for on the same tariff as other users of the car park. To avoid confusion, you should always check the terms. Why have the DVLA provided Smart Parking with registered keeper details? Registered keeper details are provided to Smart Parking by the DVLA when a vehicle has been parked in breach of the Terms and Conditions of a private car park. In order to be able to request this information Smart Parking is a member of the British Parking Association's Approved Operator Scheme. Does Smart Parking have the authority to issue PCN's? Smart Parking can confirm that it only operates on sites that are situated on private land, are not council owned and that Smart Parking has written authority to operate and issue PCN's on all of its sites from the landowner. Are Parking Charges enforceable in Scotland? In the recent Scottish court case of Vehicles Control Services v Mackie  A7/15 the Sheriff found the Defender, as the driver of the vehicle, to be in breach of contract and liable for the agreed sum of £24,500. The Defender, who had received multiple Parking Charges, disputed the claim on the basis that they believed Parking Charges to be illegal and unenforceable in Scotland. It was established that the Defender had ignored all of the Parking Charge Notices received out of principle. How was a contract formed with the driver? The PCN issued for and on behalf of the landowner are levied on the basis of a contract with the motorist, set out via the signage at the site. The signage sets out the conditions under which a motorist is authorised to park, be that by payment of the appropriate paid parking tariff or by parking within a limited stay period or similar, and that a PCN will be payable, if the conditions are not met. We ensure signage is ample, clear visible and in line with the BPA (British Parking Association) Code of Practice to ensure the motorist is bound by them when they enter and remain at a client site, so that all users of the site are obliged to follow these rules. Case law, which has been tested in court, such as Vine v London Borough of Waltham Forest  proves particularly useful in respect to the creation of a contract with the driver. This is again reiterated in Section 7.1 of the Department of Transport’s guidance on Section 56 and Schedule 4 of the Protection of Freedoms Act 2012. 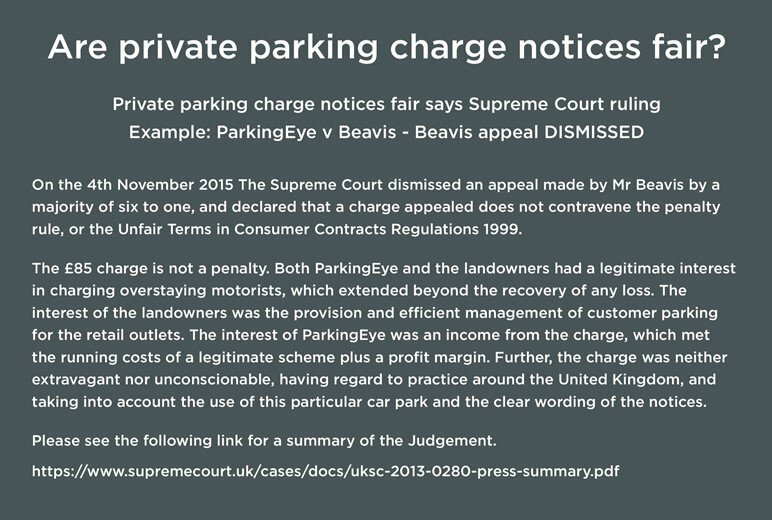 This provides strong evidence that if the signage and terms and conditions are sufficient it will be considered that the driver has entered into a contract to park on the land.The Protection of Freedoms Act 2012 also introduced the concept of 'keeper liability' for vehicles parked on private land. However, for this, there had to be an independent appeals service, provided by funding from the parking industry. That independent service is known as Parking on Private Land Appeals or POPLA. Assessors at Parking on Private Land Appeals (POPLA) determine appeals from those who have been issued with a PCN, in respect of vehicles parked on private land. The motorist must first have made their case (‘representations’) to the operator who issued the PCN and have had their representations rejected. POPLA is independent of all parties to appeals, including the operator and the British Parking Association, as are the Assessors who make the determinations. Will the PCN increase if I lose my appeal with POPLA? You will have already lost your right to the early payment discount offered by Smart Parking and be liable for the full cost of the PCN. If your appeal is refused, in order to avoid any further action you should pay the full PCN within 14 days. Do not send payment to POPLA.